Honey, Stop The Car! This is the home you have been searching to find and located in Sun City Center! The home sits on a beautiful, peaceful and quiet lakefront property with a wonderful view! This Twintree model offers two master suites each with adjoining bathrooms as well as a waterfront, tranquil view. This model is well-known for the spacious room sizes throughout the home. 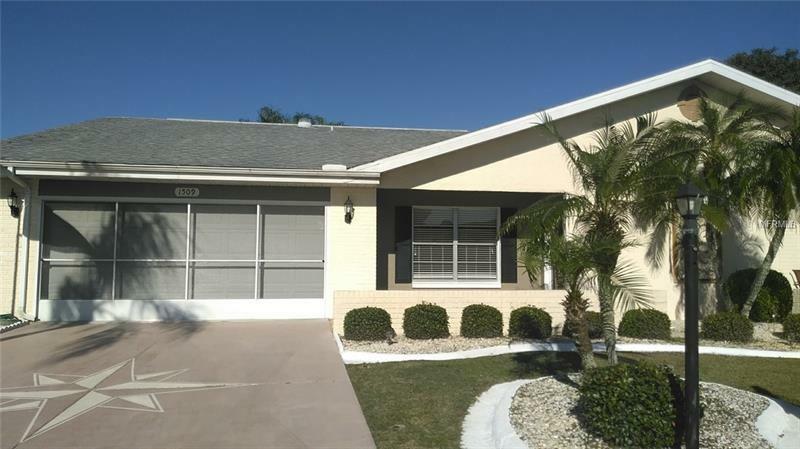 This house provides many features including a very large living room, family room as well as an extremely large Florida room. The home has a screened in lanai with a relaxing view of water and the Florida native birds. Also, included is newer carpet and stainless appliances. No worries, the home has updated plumbing and a new electrical box. Hoa fees are very low in this community. Sun City Center is an active over 55 community that offers may amenities to their members such as indoor and outdoor swimming pools, hobby and crafts, woodworking, tennis, pickle ball, softball, theater events, softball, archery and many more activities. This home is a must see and it won't be on the market for very long!